Seventy two per-cent of the population access internet on tablets or smartphones while 'on the go' (ONS 2017) . It’s what is known as the ‘mobile web’ and all our websites are now mobile ready. We employ a technology known as ‘responsive design’. This changes the formatting of a site according to the devices they are being viewed on. Once your website has been built in a responsive format your customers will be able to browse your site in their home or office or whilst on the move. How do responsive websites work? They recognise the type of device they are being viewed with (whether a desktop or laptop, a smart phone or tablet devices like iPads) and change their layouts accordingly so that the website becomes easier to navigate and quicker to load. The Highland village of Aberlour is famous for its whisky, salmon fishing and as the home of Walkers Shortbread. It also hosts the annual Aberlour Highland games and is an important location for visitors to the annual Spirit of Speyside whisky festival. About Aberlour is a group of local businesses working together to increase awareness of Aberlour?s many attractions and facilities. 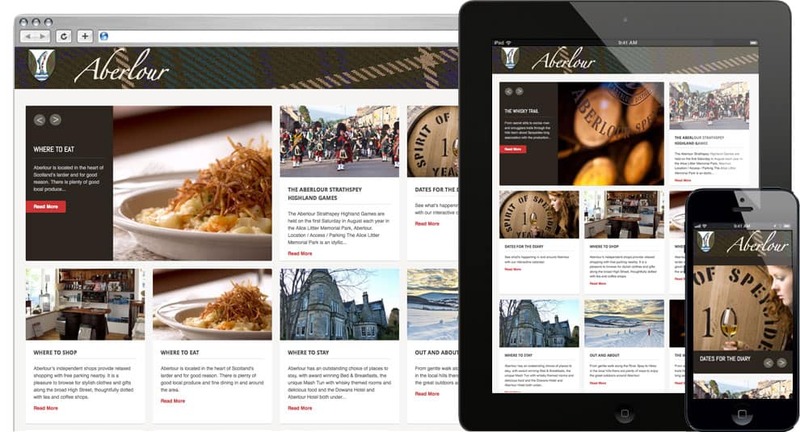 They asked Wazoo to create a website that would promote Aberlour as a visitors attraction whilst also providing an events calendar and directory of clubs and associations for use by the local community. We decided to use a system that could be easily updated by About Aberlour members whilst also being optimised for both computers and mobile devices like smart phones and tablets. As the following testimony shows, we delivered on both counts. Tim set up the website so we can edit and update it easily ourselves, add photos and update the diary. We particularly like the fact that visitors to the area can browse the site on their mobile devices, finding out more about what there is to see and do on Speyside when they are away from home.? Karen Braithwaite, Chair, About Aberlour.